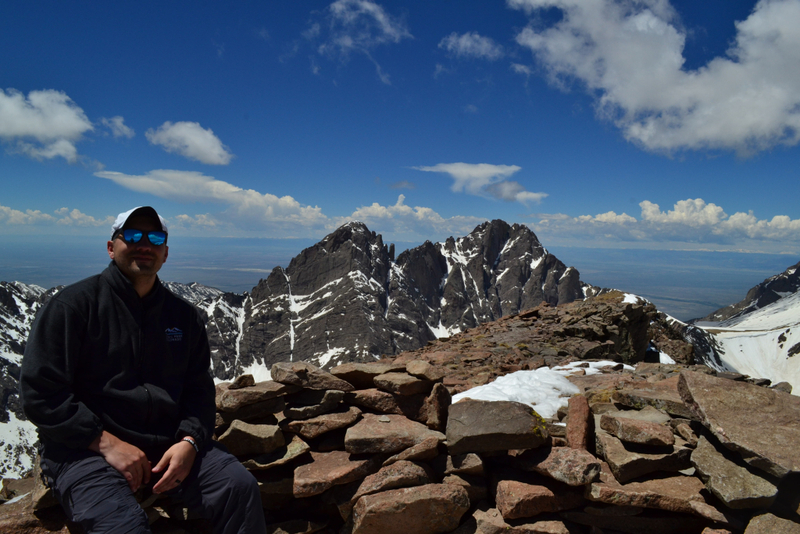 Elevation Gain: 4,337 ft. (net) Max Elevation: 14,064 ft. Min. 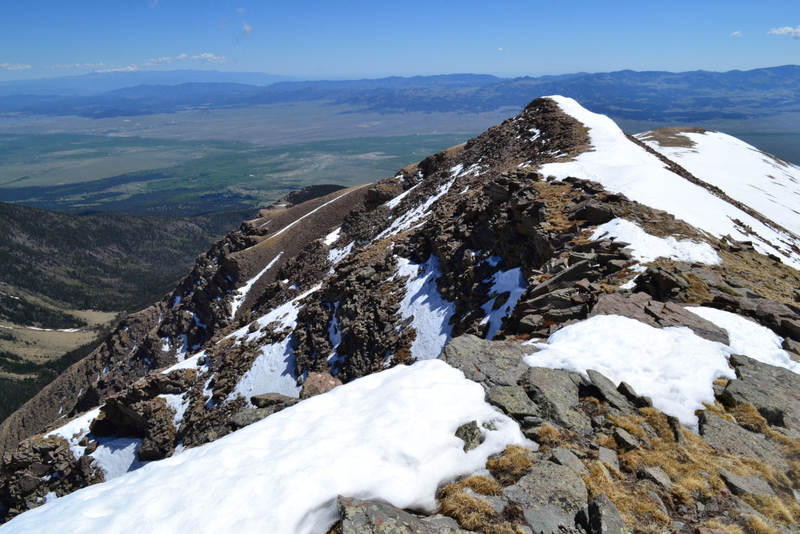 Elevation: 9,727 ft. Average Elevation: 11,755 ft.
Close-up of our route on the east ridge on the left; and a view of the entire route up Humboldt.Legend has it that the “Sangre de Cristos” or the Blood of Christ mountain range was named by a dying Spanish priest as he watched the sun cast a red hue over the beautiful snow-capped peaks. 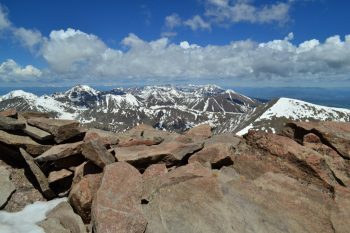 Located in the exquisite southwestern region of Colorado and extending into New Mexico, this mountain range boasts a rich history of culture, religion, adventure, and allure. 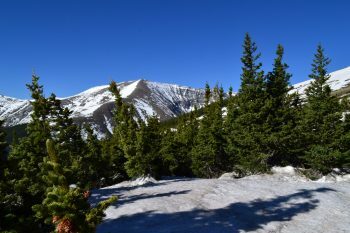 As the youngest mountain range in Colorado, estimated to have been pushed up a mere 5-20 million years ago, the Sangres’ boast an abundance of 13ers and 14ers. 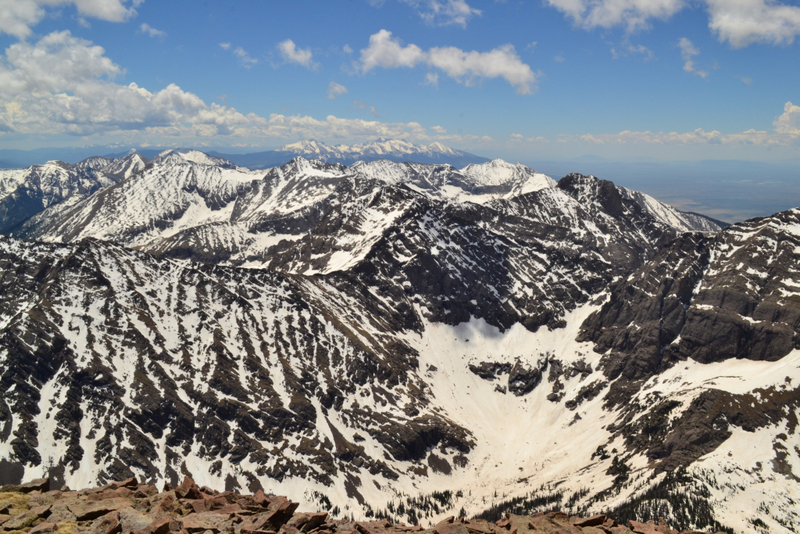 In celebration of our 6 year anniversary, we sought to explore these peaks. We chose Westcliffe, CO, located on the eastern side of the range as our base camp for a three day exploration of the area including a summit of 14er Humboldt Peak, a visit to the Great Sand Dunes and San Luis Valley, and hike to Music Pass. 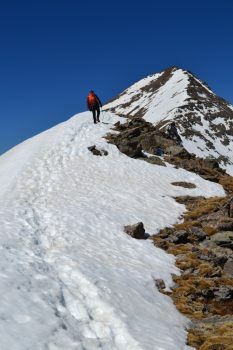 We chose Humboldt Peak as our first 14er of the season as it is often deemed a great introduction to the Sangre de Cristo range and because of the spring mountain conditions with lots of remaining snow and ice. 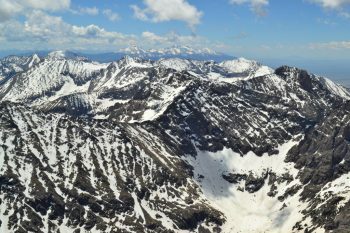 Humboldt peak reaches 14,064 feet into the sky and offers amazing views of its famous neighbors, the Crestone Needle and Peak. 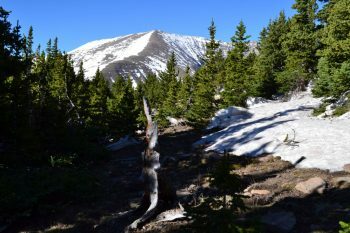 We began our hike on Sunday June 5th at 6:00 am sharp at the Rainbow Trail Trailhead which is a located off of the 4WD road that ends at the South Colony Lakes upper TH. 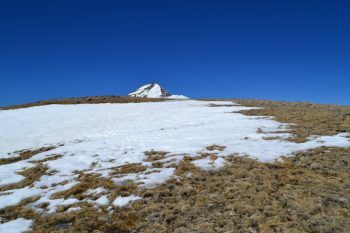 The road was relatively easy to ascend with our stock 4WD X-terra, and not nearly as bad as we have heard it described. The few parking spots were empty as we arrived at the trailhead, and the only sign of human life was a small tent in one of the spots. 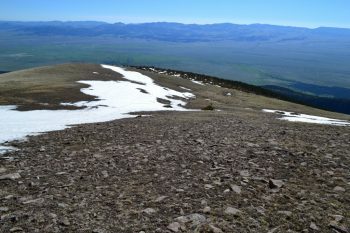 50 feet beyond the TH sign we veered right and proceeded via the East Ridge route up Humboldt. 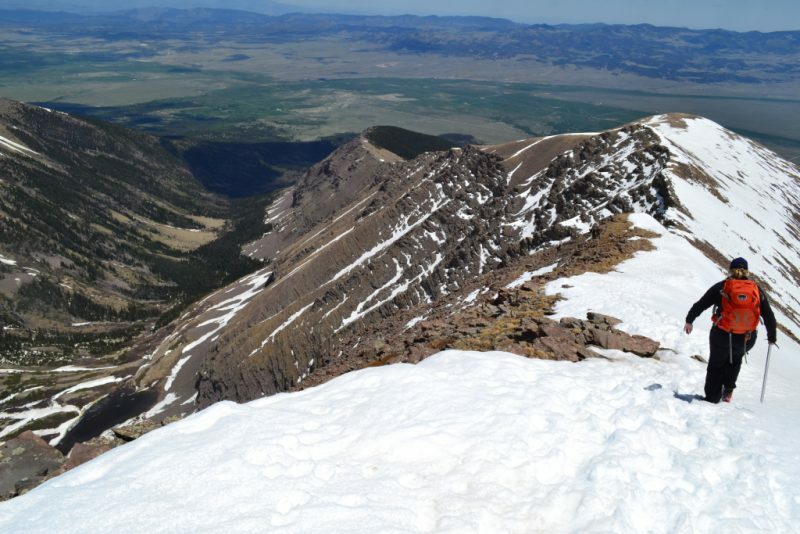 The East Ridge route is deemed a safer and shorter winter ascent of Humboldt, and with rumors and reports of remaining snow, we opted for this route. It should be noted that this route doesn’t have a defined trail in summer, and requires quite a bit of route-finding. 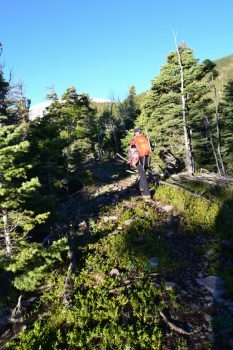 We veered off of the lovely stable Rainbow Trail after about 0.2 miles and bridge crossing of South Colony Creek, and proceeded to bush-wack through steep woods to gain a small ridge. So far there was no snow, and temperatures were quite warm for just after 6 in the morning. Our packs were full of snowshoes, ice axes, and tons of water and energy weighing close to 45 pounds. 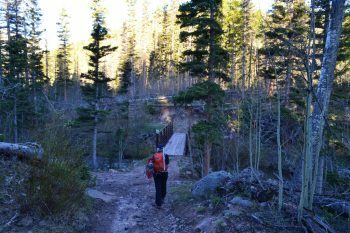 As we trudged through the woods, we soon began to feel the burden of our excessively heavy packs this early in the season. 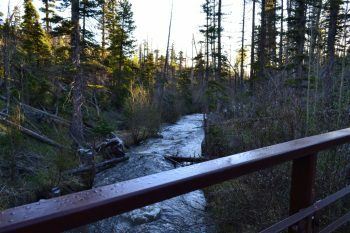 Seen below are photos of the South Colony Creek bridge crossing and early ascent to the ridgeline. We hiked southwest along the narrow wooded ridgeline, following GPS waypoints of the route to help us stay on track. 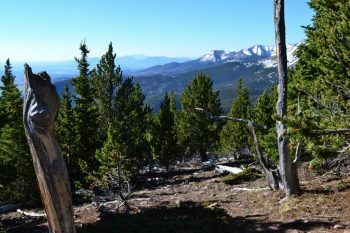 At around 10,500 feet, we turned strictly west and the forest thickened, and the terrain became significantly steeper. 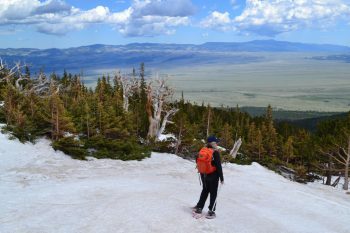 It reminded us of hiking up a sheer black ski run in the summer only with many more obstacles. 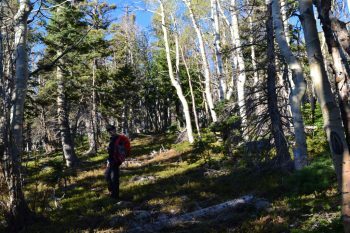 We continued to navigate through the maze of snag and deadfall focusing primarily on gaining elevation. Though we had only been a little over 2 miles, the route through the trees felt long. We felt that tree-line was never going to come within reach. 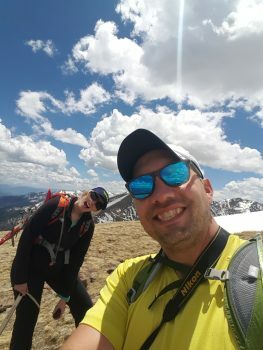 The sweat inducing off-trail adventure continued without ease until around 11,100 feet in which the elevation gain lightened up ever so slightly. 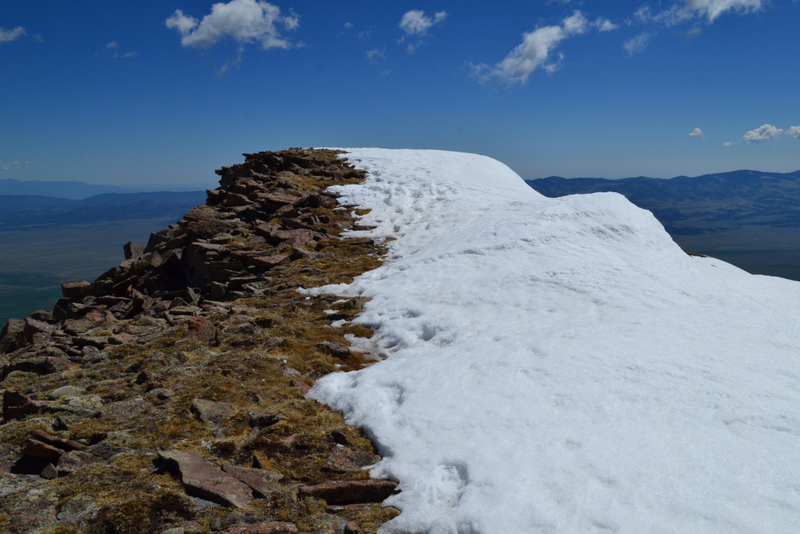 Around this point, we eyed our first stashes of wet snow. We were somewhat able to weave in and out of the snow drifts for a while with minimal post-holing. 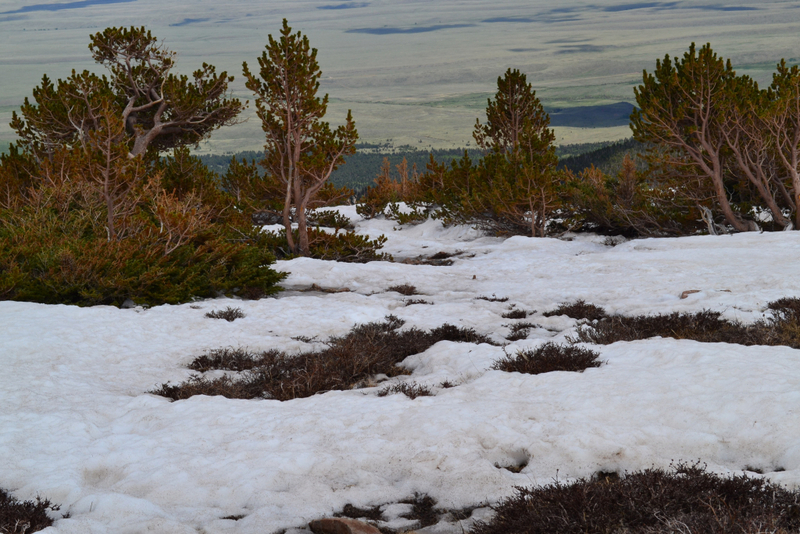 As we gained elevation, the trees finally began to thin and more and more unvoidable snow began to appear. We had to post-hole a bit through this section as the snow was not continous and unworthy of snapping on the snowshoes this early. As the trees gave way to the alpine tundra, there was a signifcant stretch of snow, and we finally snapped on the snowshoes. 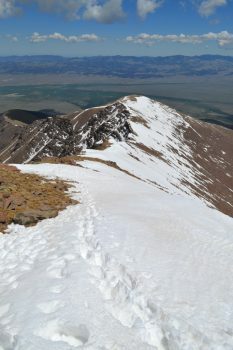 We now had glimpses of the false summit but could not yet make out our 14,000 plus foot goal. This early in the day, the snow was still somewhat sturdy enough to support our weight. 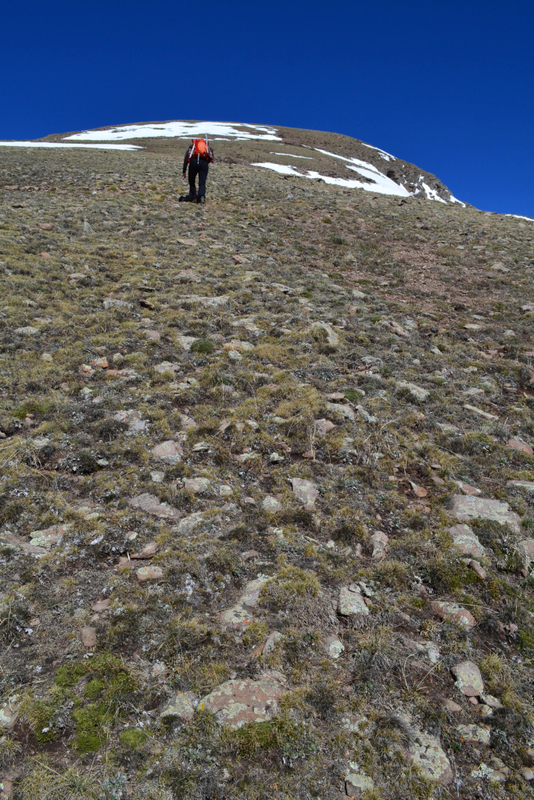 Through the steepness we trudged along. 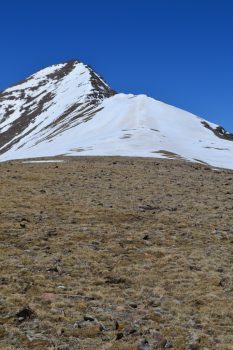 As we gained elevation, the powerful winds and bright sun left long breaks in the snow. 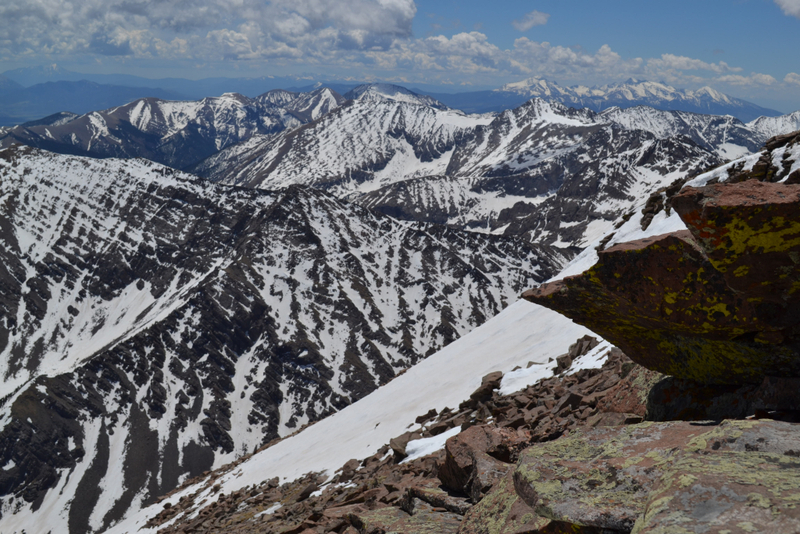 We were now in a cycle of switching between boots, snoeshows, and microspikes with the variable conditions. 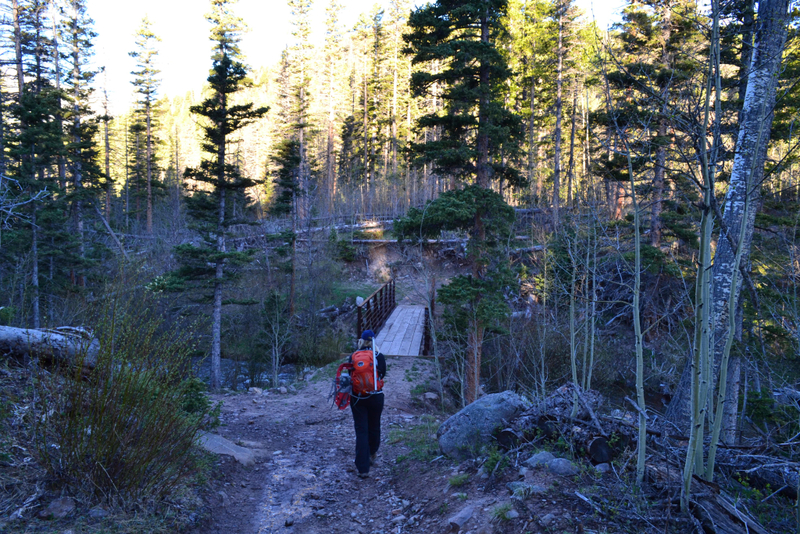 As there was no trail to follow, we headed the only obvious direction…up. 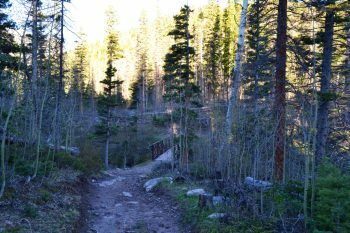 The lack of a designated path also meant a lack of switchbacks. 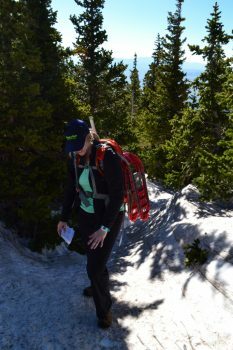 While we have cursed the switchbacks on many a day in the mountains, at those times we neglected to appreciate the ease in elevation gain they provide. 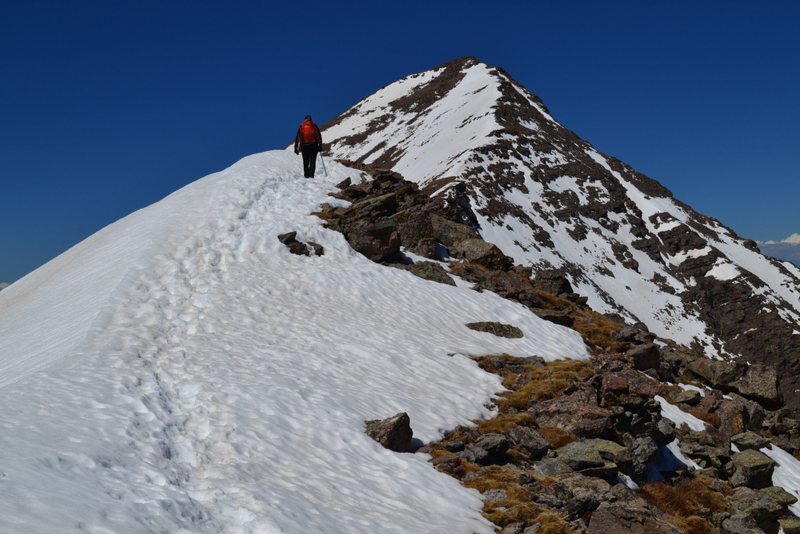 On this particular summit day, we headed straight up wasting no time traversing across the tundra to ease our pain. 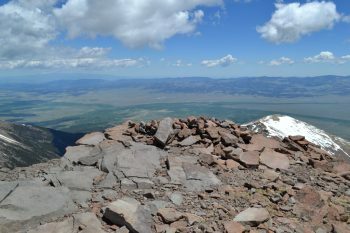 While to our west, our eyes were met with a vast rise in the earth that would not end, the east provided sweeping views of the small town of Westcliffe in which we were staying and the surrounding Wet Mountain Valley. After slowly making our way up the false summit we got our first glimpses of Humboldt peak at just a little over 13,000 feet. However, we still had 1,000 feet of elevation to climb and the East Ridge still appeared to be a long and arduous journey for our early season conditioning. It is precisely one mile from this point to be more accurate. 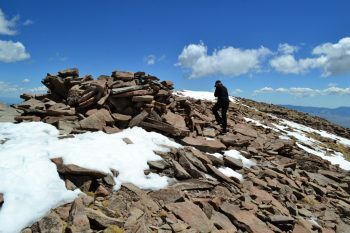 As we cleared the false summit, the route flattened a bit providing a brief reprieve. 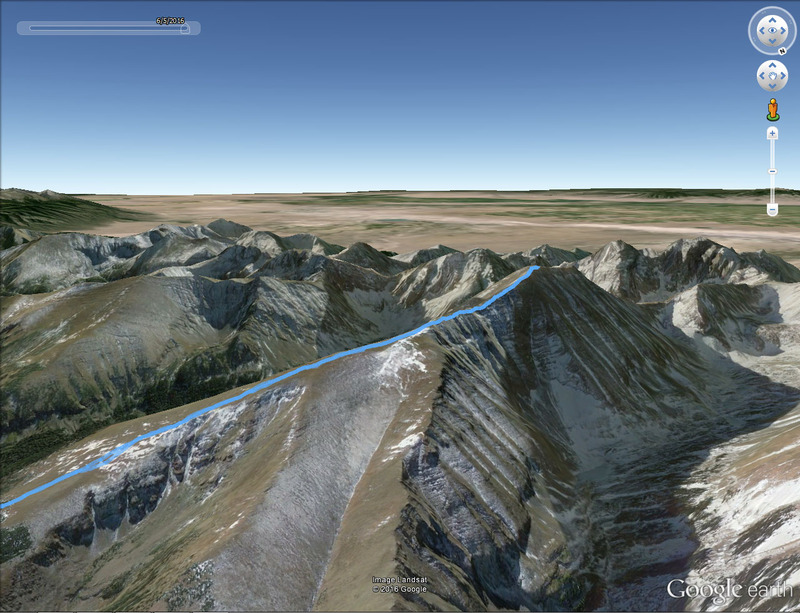 We could now see the East Ridge and our remaining route. At this point, the terrain became more dramatic with a bit of exposure. Snow covered the way to the top. Precipitous cliffs were a few feet to the right of our path (north), and steep icy chutes lined our left (south). 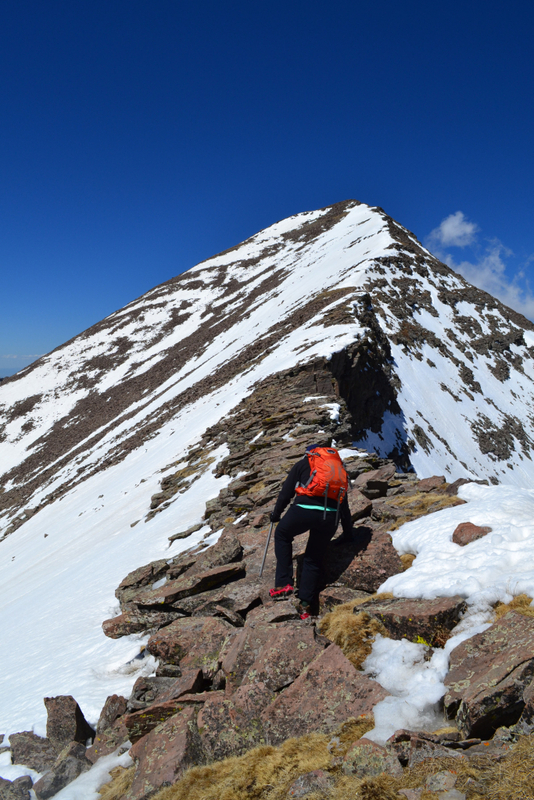 We stashed our snoeshows shortly after beginning the ridge and proceeded carefully with microspikes. 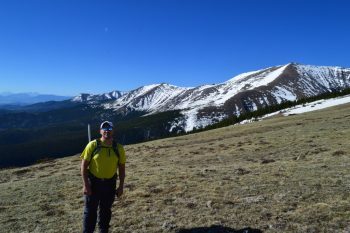 Seen below are photos of our trip across the ridge. The exposure was exhilarating and a little unnerving at the same time. 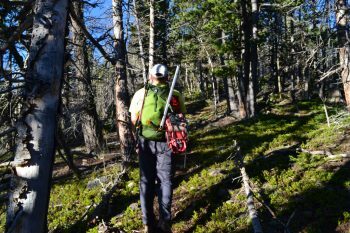 We had our ice axes in hand to ensure we could self-arrest if we slipped to the left. Slipping to the right was not an option. 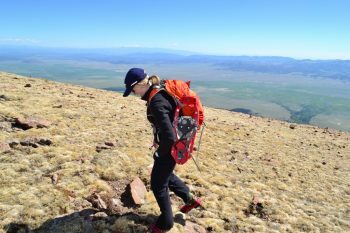 The remaining 400 feet seemed quite steep but with the summit so close, we employed a reserve stash of energy and continued strongly onward. A final quick class 2 scramble on dry rocks led us to 14,064 feet. The summit provided sensational views of the Crestones (Crestone Needle and Peak) to our west and sweeping views of the rest of the southern Sangre de Cristo range. 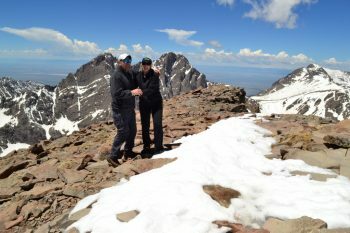 We also had the summit completely to ourselves. 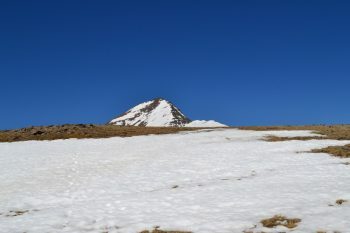 The weather was perfectly calm and bluebird skies remained. 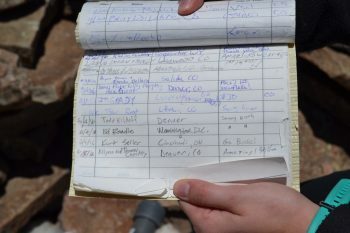 We signed the summit registry and noted we were the only signature for the day. 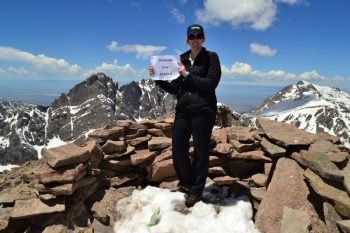 There was also a peak sign in the canister which was a neat find since we hadn’t made our traditional sign for this climb. 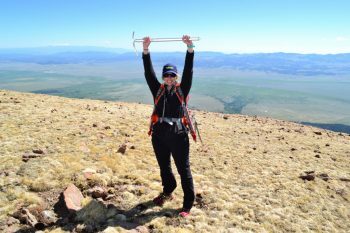 Perhaps it was because we weren’t truly sure of a successful ascent this trip with our recent limited high altitude exposure and spring mountain conditions. 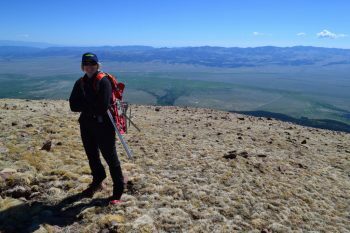 We stayed on the summit longer than usual (30 min) due to the relaxing solitude and spectacular views. 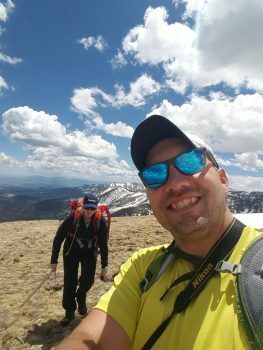 Seen below are photos from the summit. What goes up, must come down. 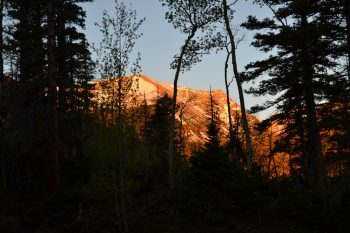 As morning began to shift to afternoon, we knew we needed to begin our journey back down. 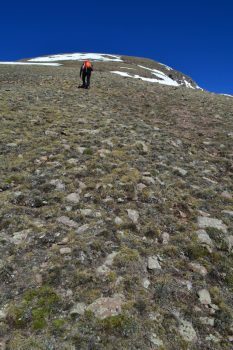 The trip down the narrow steep ridge was not one we were looking forward to. 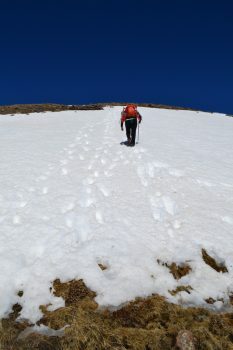 We carefully proceeded down the steep snow packed path, following our tracks from the ascent. The declivitous route wasn’t nearly as nerve-wracking this time around, but we traveled slowly and carefully nonetheless. The descent of the ridge took a while, but our speed increased greatly once on the flats and false summit. The ice was now slushy and wet (noon) as we made our way to treeline. 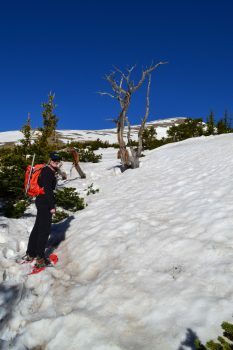 We rested briefly just before treeline and donned our snowshoes one last time. 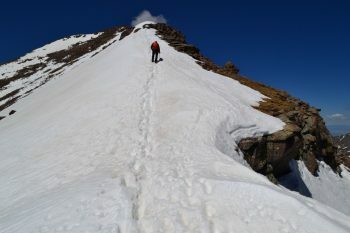 We had absolutely no traction this time around and might as well have been skiing down this brief sectional. Seen below are photos of this portion of our descent. We prodded through the maze of forest once again and felt the first trickles of an afternoon rain shower. 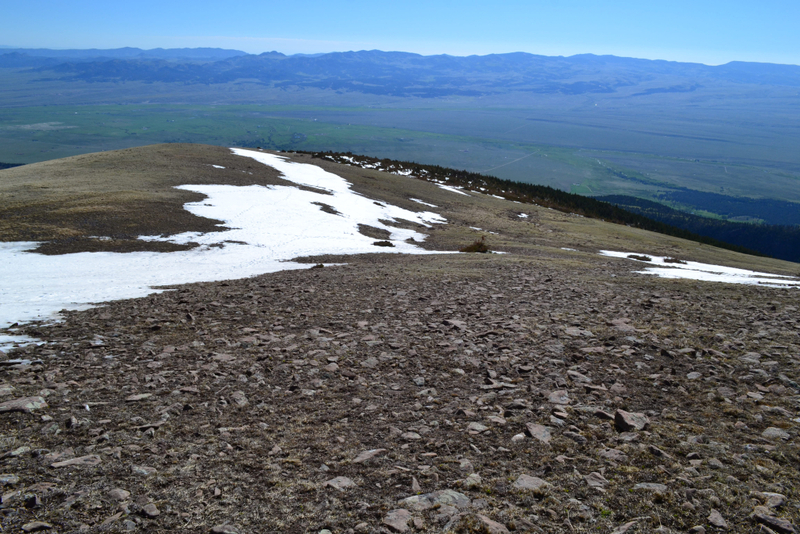 It continued for the duration of our descent and turned into hail once we reached the Rainbow Trail. Thankfully we were about a half mile from the truck, so our suffering was limited. The sight of the X-terra brought smiles of joy and relief. 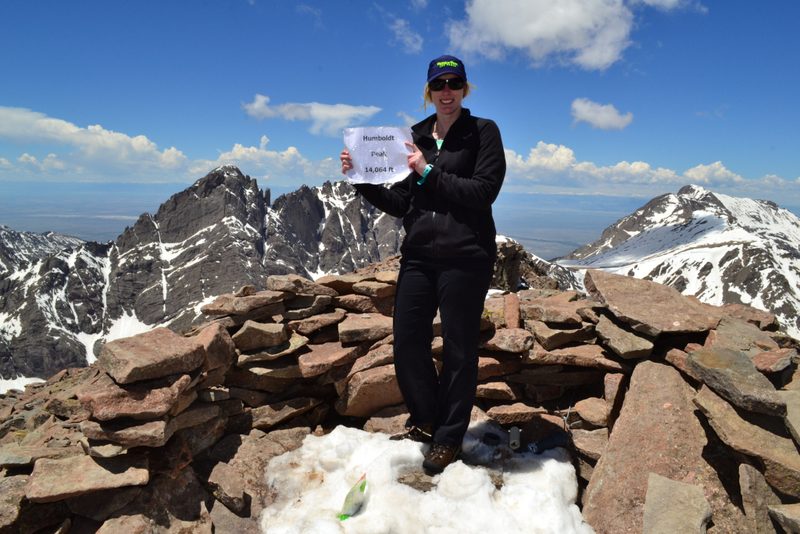 While we had an amazing summit our feet were soaked and tired. The tent from earlier was gone, but a truck was in one of the other pull outs. Still, no sight of people anywhere. 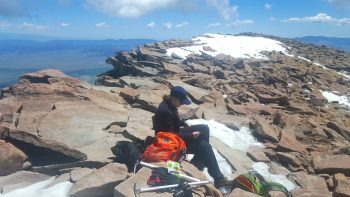 Overall, we highly recommend Humboldt Peak. 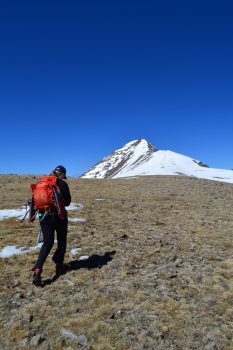 It was a great introduction to this challenging mountain range, and the East Ridge route was an exciting off-trail, remote experience. Once the snow completely melts, the West Ridge would probably be a more ideal choice and is deemed the standard route of the summer. 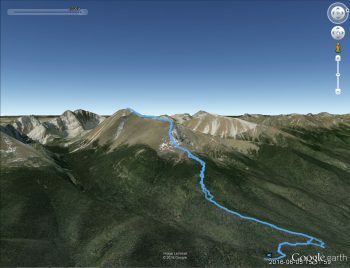 We hope to try this route out in the future. Stay tuned for more highlights and hikes from our visit to the Sangre de Cristos and Great Sand Dunes. What an incredible start to a Colorado summer, and an adventurous anniversary trip! 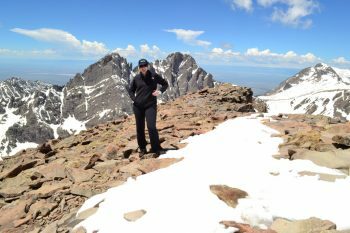 Beautiful photos enhance the vivid narrative of this hike to the sky.